Valves are small, with a concentrically undulate face and an annulus in the valve center. Areolae are difficult to resolve in LM. In the central area, areola are weakly organized near the annulus and then become organized into fascicles toward the margin. Fascicles are uniseriate near the valve center and become multiseriate near the margin. The number of total fascicles ranges from 26 to 55 and decreases with valve diameter. One to 3 central fultoportulae may present. 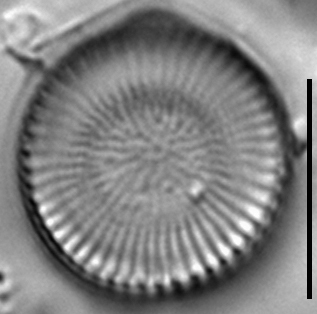 Cyclostephanos tholiformis and C. delicatus are indistinguishable in LM and they co-occur (Håkansson and Kling 1990). 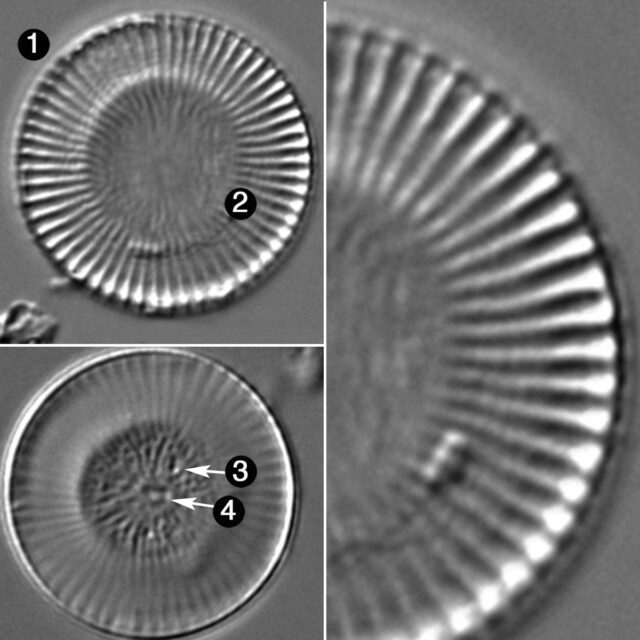 According to Håkansson and Kling, C. tholiformis is distinguished by one to three central fultoportula, interfascicles that branch on the mantle interior, marginal fultoportulae beneath every third to fourth spine and two satellite pores at each fultoportula. In contrast, C. delicatus has only one central fultoportula, internal fascicles on the mantle are non-branching, marginal fultoportulae occur beneath every fourth to sixth spine and three satellite pores at each fultoportula. Cyclostephanos tholiformis was described from Lazy Lagoon on West Lake Okoboji, Iowa. The planktonic algal assemblage of this canal was characterized as hypereutrophic (Stoermer et al. 1987). 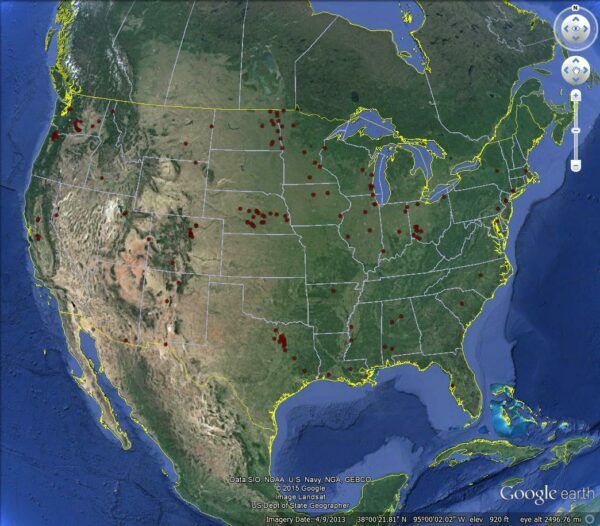 Distribution of Cyclostephanos tholiformis in rivers of the continental U.S. based on the National Water Quality Assessment program. Retrieved 03 June 2015. 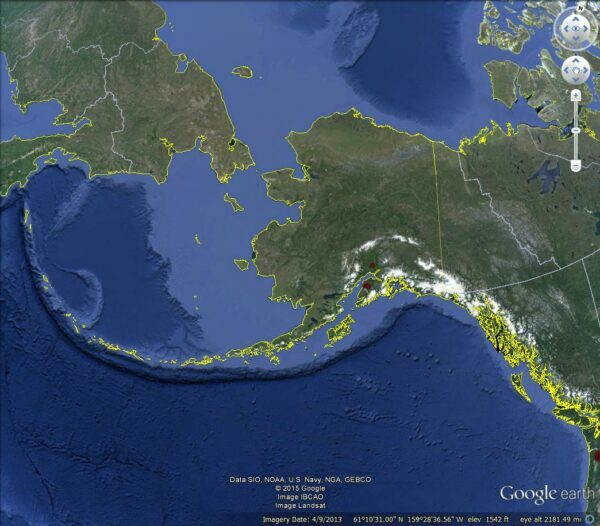 Distribution of Cyclostephanos tholiformis in rivers of Alaska based on the National Water Quality Assessment program. Retrieved 03 June 2015. Living cells occur singly or in short colonies. Frustules circular in valve view; short, cylindrical in girdle view. Valve face raise or depressed in the centre, marked with radial fascicles of fine punctate striae, separated by obvious interfascicles. Interfascicular ribs single on the valve face, branching on the margin of the valve. Valves from 7 to 10 µm in diameter, fascicles 12 to 13 in 10 µm. Spines occur on each thickened interfascicle near the valve face-valve mantle junction. A rimoportula (sic, this should say "a marginal fultoportula") occurs below every third or fourth spine. One, rarely two or three, fultoportulae occur eccentric to the valve centre. 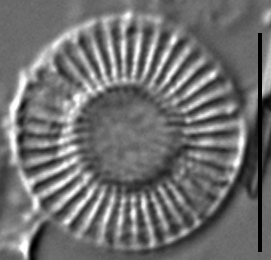 A single rimoportula with sessile internal labium and inconspicuous external opening occurs on a rib branch on the valve mantle. 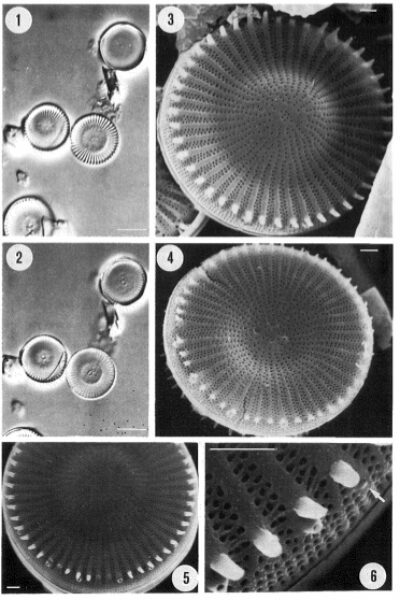 Håkansson, H., and Kling, H. (1990) The current status of some very small freshwater diatoms of the genera Stephanodiscus and Cyclostephanos. 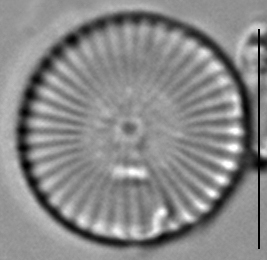 Diatom Research, 5(2): 273-287. Stoermer, E.F., Håkansson, H. and Theriot, E.C. 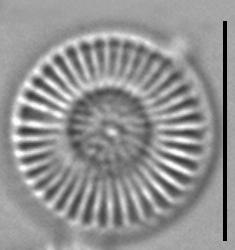 (1987) Cyclostephanos species new to North America: C. tholioformis sp. nov. and C. costatilimbus comb. nov. British Phycological Journal 22: 349-358. Valves are small and concentrically undulate. 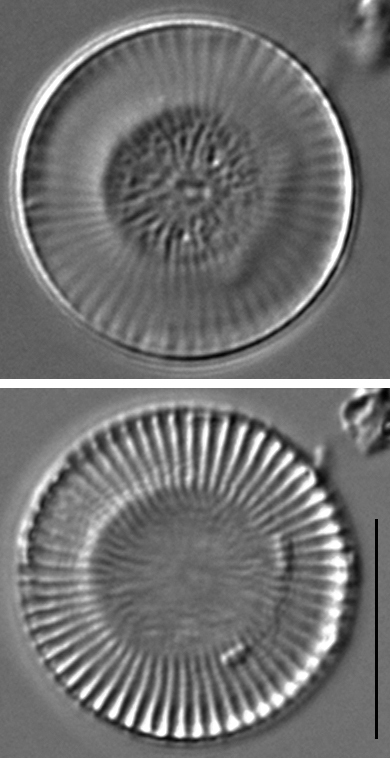 One to three central fultoportulae are present. 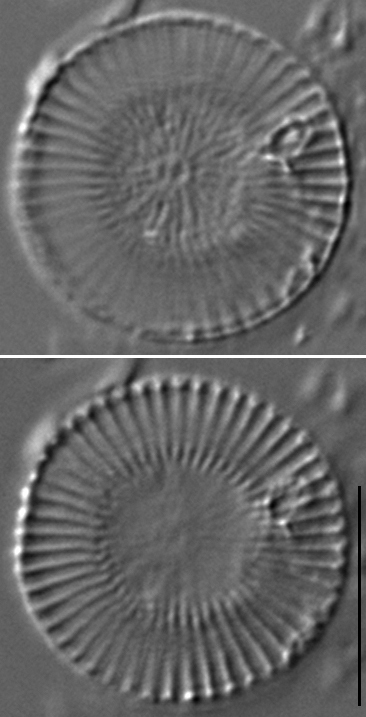 Striae are arranged in fascicles, which radiate from a central annulus. Fascicles are uniseriate and weakly organized in the central area, becoming multiseriate near the valve margin.